Stunning main deck area under a massive jackalberry tree on the banks of the Sabie River – definitely one of THE most special places to chill and get in some great game viewing at the same time! We love having a private viewing deck with plunge pool overlooking the Sabie River – it’s heated too so you can enjoy it all year round! Suites almost bring the outdoors in as the bath and double (outdoor and indoor) showers have large windows allowing unobstructed views of the river - the underfloor heating is great too in winter! Lion Sands Tinga’s concession area is in the prime game-viewing area of the Southern part of Kruger – with 30km of Sabie River frontage as well as 14 km of the Sand River, this is arguably the area with the richest wildlife concentration and diversity in the entire country! 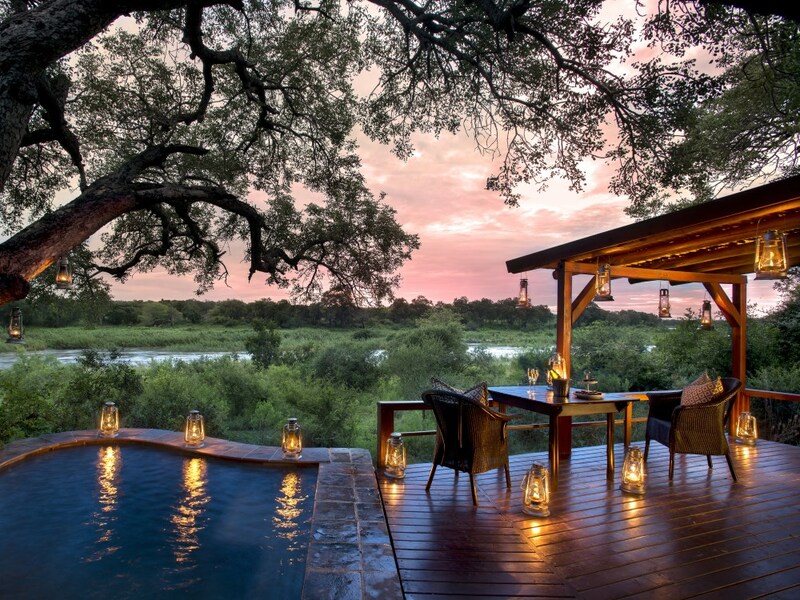 Everyone knows about the famous Sabi Sand reserve and the spectacular wildlife sightings there, and with very good reason too – well Lion Sands Tinga is the neighbour on the other side of the river from the famous Lion Sands lodges of the Sabi Sand. This close proximity to Lion Sands has in fact resulted in the More family, the owners and operators of Lion Sands, now taking over the running of the 2 lodges on this prime concession and rebranding them as Lion Sands Tinga and Lion Sands Narina (which was previously known as Tinga Narina) That has meant that the same warm hospitality and service excellence that the Lion Sands lodges have become famous for is now also in evidence at Lion Sands Tinga! 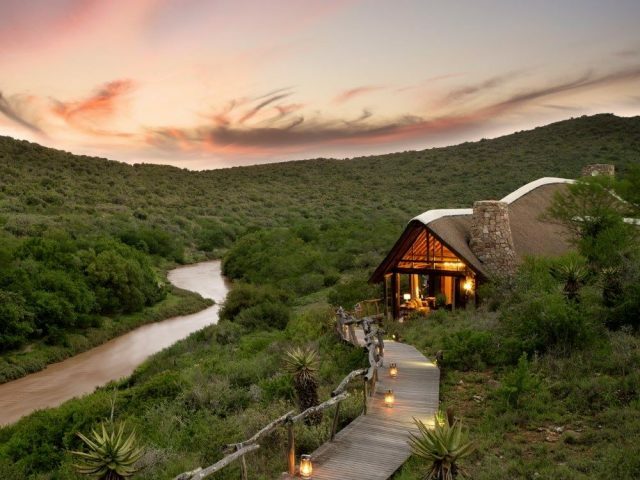 Whilst the 2 lodges on the concession are in some ways very similar – for example they both consist of 9 suites each, both are situated on the banks of the Sabie River, both boast luxurious suites with private plunge pools etc – however they each possess entirely different characters and feel. Whilst Lion Sands Narina has a distinctly “African” look and feel, Tinga feels more grand with its character being almost that of a colonial gentlemen’s club. Take for example the cosy library filled with an array of African literature to be enjoyed in the old world luxury of leather couches, Persian carpets and dark woods, an impressive wine cellar, not to mention the scattering of antelope horns displayed in the walls. The imposing double volume entrance space leads through to what we think is the lodge’s most impressive feature of all, the stunning main view deck perched under a massive Jackalberry tree with magnificent views over the Sabie River and, of course, the profusion of wildlife that regularly comes down to drink there. Perched seemingly a few feet above the Sabie River, this deck has to be one of the best places in South Africa to simply relax with a good book and a pair of binoculars. In the heat of summer you can take relief in the large infinity swimming pool situated alongside the deck and also enjoying unobstructed views of the river. Other welcoming spaces and facilities at Lion Sands Tinga include the bar and comfy lounge with two huge double-sided fireplaces and a boma where you will enjoy your meals under the African night sky. The 9 luxuriously appointed suites are air-conditioned, comprising of enormous en-suite bathrooms (with underfloor heating) which are designed to enhance your whole bush experience as the bath and double (outdoor and indoor) shower have large windows allowing unobstructed views of the river where you can watch the animals pass right by - whilst still retaining your privacy. The suites also feature a private lounge for those lazy afternoons to stretch out and read a book. All suites are spaced apart, blending with the surrounds where game viewing can be done from the privacy of your own viewing deck or your heated plunge pool overlooking the Sabie River – what better than to spend your afternoons lounging on the deck or in the pool while viewing the wildlife and listening to the peaceful sounds of the African bush! 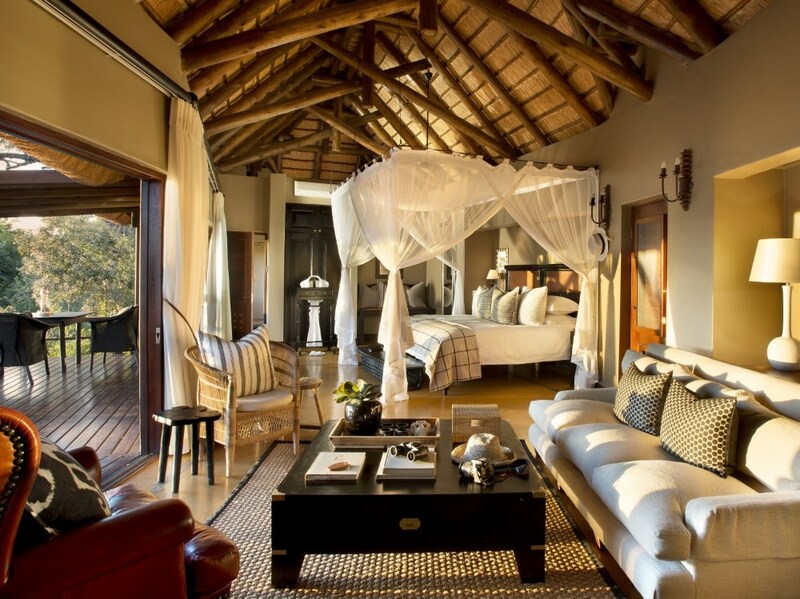 If you do manage to coax yourself from the luxurious embrace of your suite then you’re in for a treat as the game viewing at Lion Sands Tinga is some of the very finest in South Africa - the Sabie River is said to have the richest diversity of any South African river, with many endangered and rare species being found in the area such as Black Rhino whilst it is also the nesting site of the rare southern ground hornbill and saddle billed stork – it also boasts the highest recorded density of leopards in Africa! 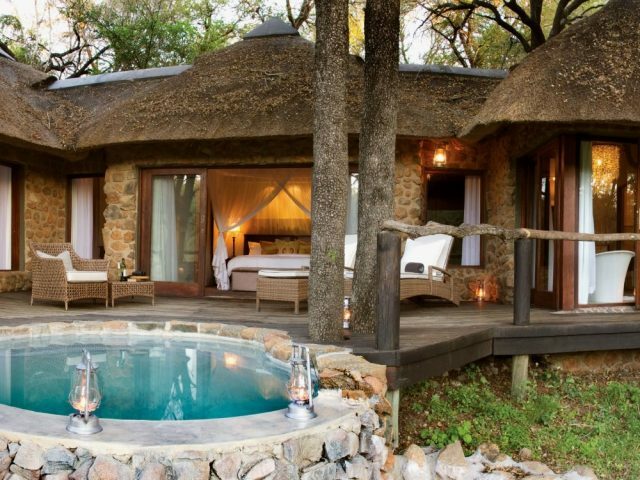 This is an all-year-round safari destination where the variation in experience is temperature-related rather than safari related (and the good news is the plunge pools are heated so you can enjoy them all year round!) as there are not any significant migratory species. 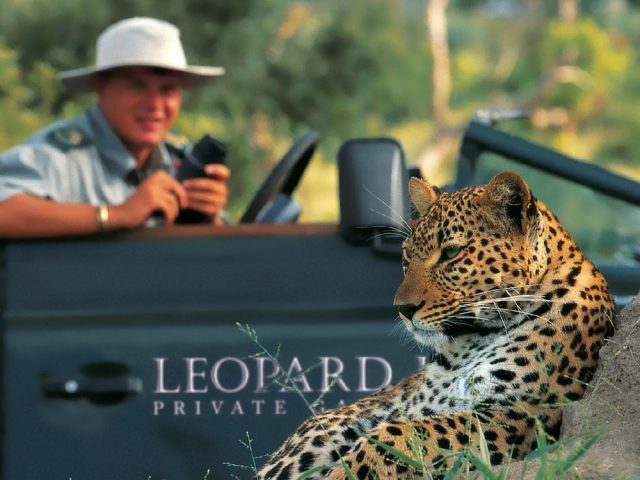 The exclusive 5000 hectare concession allows off-roading in pursuit of confirmed Big 7 sightings (Big 5 plus cheetah and wild dog) and is also unique in having access to both the Sabie and Sand rivers – this offers both scenic beauty as well as stunning game viewing! Morning and evening game drives in open 4x4 vehicles or bush walks are accompanied by expertly trained rangers who will provide you with loads of information on all aspects of ecology - and are also incredible hosts. When not out in the bush you can always find something to keep you busy with such activities as bird watching, astronomy, river walks, wildlife lectures and wellness treatments on the menu. There are even kiddie’s activities to keep them out of your hair such as identifying spoors and making moulds or even bug hunting!